Today the voice of every general category student is to stop the reservation ant it is 100% correct. As they are demanding their right of equality. Nobody can stop us and we want positive answer. A single person can't do any thing in this world, will have to unite and then fight. As real power is in unity. Without unity our country rating is zero. 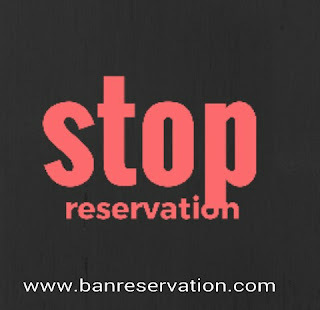 As this reservation policy is creating differences between people. Today the number of other category people in government jobs is increasing day by day and general category students are becoming negligible, very hard to find. We should try to remove this reservation from our country by the method of non violence as is is proved to be the best method by our countries famous personalities like Mahatma Gandhi and many others. This method also gives the best results as compared to violence. This reservation policy is creating differences among friends, neighbors and people of same locality. It is possible to remove reservation from our country but it requires lot of hard work and strong determination. We also know that hard work is the key to success. Which means if we do hard work then only we get success. If you find any one or two then you will also see that those persons are only doing their work well as they came up on the basis of ability not reservation. If this reservation system come to end then everyone will work hard to get job as competition also increases and there will be peace in the minds of general category students. All the categories will become one and there will be love among each other. Today people made different thinking about different category people in their minds. Which is creating divisions among each other. It is said that all are equal but it is complete wrong. We are dividing us on the basis of different categories and creating disunity. This reservation system is the big root of growing corruption in the country. And the whole country is coming in trap of it. Today a general category person has to score 90% marks where as a SC category student has to score only 50%. This is a big discrimination done to the people of Indians. All are the people of India and all are having one brain. All are people of god and should be treated equal. General category people are reaching to poverty line due to reservation. Students are filled up with jealousy because of reservation. In my every post the main thing is equality and unity among Indians. IT IS THE VOICE OF THE PEOPLE OF INDIA.